We have asked a number of our regular/irregular contributors various question about Newcastle United – the events of last season and moving forward. What would be your ideal first Newcastle Premier League fixture of the season? For me as a fan it would be nice to start with a big home game. I had to watch so much rubbish last season, I think I have earned the right to watch the likes of Silva and Sanchez from the off instead of watching Craig Gardner. If we started with WBA away it would be just like last season. The team should be up for that too, why not play Chelsea away and see what it takes to win the league. Then the team can see how good they are and how much they have to improve to be up there. Christian Atsu signing permanently a positive? Yes. He did ok last season, just enough for me to think he can offer us something in a decent Premier League team. The price is realistic, the potential there and he’s already bedded into the squad and the area so he should be raring to go from the start. It might not work out but I think and hope he is worth the gamble. If it pays off we’ve got an exciting player for a good price, if it doesn’t pay off we’d get a lot of that money back if we sold him. Three words to describe how you feel about Newcastle United at the minute? Which of the current Newcastle squad would you be 100% happy with being first choice when the season kicks off? It’s a tough question to answer because it is relative to other signings. For example, I’d be happy with a first choice defence of Dummett, Lascelles, Clark and Yedlin, if we bought players like N’Zonzi, Sigurdsson, Townsend and Carroll further up the pitch. I’ve just made up those players off the top of my head by the way, I’m not saying those players exactly, could have been Modric, Neymar, Bale and Messi just as easily. What I would say is that I think most of the current players are capable of playing some part in the Premier League so I’m not desperate to see the back of many of them. I reckon any 6 or 7 of them would make up a mid-table PL team if the other 4 or 5 signings were quality players with plenty of experience. I think Krul could make a difference as well when he comes back from loan. I know I am in the minority there but it is what I think. I would like to see Mbabu get a shot as Yedlin’s understudy as well, very similar players and both full of pace. The three positions most in need of strengthening? The spine of the team needs experience. A new centre half or defensive midfielder with 250 top flight games under their belt who can slot straight into the team and do the simple things would be first. I like Hayden and Shelvey in there but we don’t have any quality replacements and they both lose it sometimes, we can’t afford that too often in the top division. Second, a striker who will score 10+ goals to compete with Gayle. Mitrovic and Murphy can’t offer that for different reasons but one of them probably still has a job to do at the club. Third, a creative player. Could be a number 10 or a winger if Matt Ritchie moves to the number 10 role, which I think he can. Whoever it is, they need to contribute goals, assists and do a lot of covering. How did the Championship season turn out compared to what you imagined would happen? As expected really, I thought we would go up quite comfortably and never really had any doubts. It surprised me that the likes of Fulham, Huddersfield and Reading turned out to be three of the better teams while Villa and Norwich were hopeless. The only other thing that surprised me was how much I didn’t enjoy it. I just wanted it to be over so I could get on with my life. Who were Newcastle’s three key players last season? The defence turned in some great performances when we were winning games 1-0, especially away from home, but I’m not a 1980s Arsenal fan so I’m not going to sing songs about it. Gayle’s goals were vital in the first half, Ritchie’s work-rate and commitment a key in the second half. Although we could honourably mention a few others, Shelvey was a key player for me. He was pretty much the only entertainment in the whole division. Even when he was kicking people off the ball or swearing at the ref, he was always worth watching. He’s the new Craig Bellamy, we will hate him when he’s gone but as long as he plays for us I will enjoy his brilliance and nonsense in equal measure. Newcastle Captain? Jamaal Lascelles, a different one from the current set of players, or a new one ideally needs to be brought in? The only thing a captain seems to do now is liaise between the other players and the referee, I don’t see what else they do. Ok, occasionally a Shearer, Keane, Gerrard or Terry comes along who brings with them a whole new mentality but generally I don’t know who captains teams now. Teams should pick a captain with a psychology degree or one who knows Jedi mind tricks to influence referees. I don’t think we need a captain to inspire or drive the team on, we’ve got a manager who does that from the sidelines with his constant chatter. Would you have kept Anita and/or Gouffran? No. We’d have to have so many injuries for either of them to get a game that we’d lose anyway. I’d rather give a younger player a chance if that was the case. Probably a 10. He got rid of the players who didn’t want to stay for a shed load of money and that was very important. He spent much less than he brought in and we got promoted. Fair enough, some of the signings didn’t work but they were not our biggest money players, they mostly gave their all and we will get most of the money back for them. There were no Boumsongs or Luques in there, even Diame and Hanley made a contribution somewhere. His two major signings financially were Ritchie and Gayle and they were two key players in the season. If he signs Willy Caballero in goal this summer though I’m changing it to a ‘1’. He’s a liability. Again a 10. He’s one of the best managers in the world. Just because we didn’t fly into teams and score 5 goals in each game doesn’t mean he knows nowt. He sets his teams up to be solid and progressive. All of the best managers instil a style of play on their team. Just because I don’t like Rafa’s style of play doesn’t mean he isn’t brilliant. I don’t see many people slagging off Pep for being tactically naive just because he doesn’t shut up shop with 10 minutes to go, or Jose because his teams are negative. These managers are tactically brilliant for getting their teams to play in the style they want for as much of the games as they do. The only managers who claim to make a change that works during a game are bluffers like Fat Sam and Pardew and we know they can’t bluff us because we watched them flounder for most of their time here. Even a blind squirrel finds a nut every now and again. Benitez has total control over his players and their style of play. There are only a handful of managers in the world who are at that level tactically. I’m tempted to say 0 but then he would be equal to the aforementioned Fat Sam and Benitez deserves better than that. With my utopian beliefs of free-flowing attacking football me and Rafa are never going to see eye-to-eye. NUFC are more entertaining than his gawd awful Valencia team that admittedly won a couple of league titles, but we are talking entertainment here, not success. Nearly 20 years ago I saw Jay Jay Okocha do a Cruyff turn and it took Jenas and Dyer 10 yards of running in the wrong direction to realise that Okocha was skipping off the other way. The game finished 0-0 but I went home entertained by that turn alone. I pay my money to see that sort of brilliance, if I wanted to see something well organised I’d pay to look at my Dad’s gas bill folders chronologically dated back to 1953. I reckon Rafa would love it. 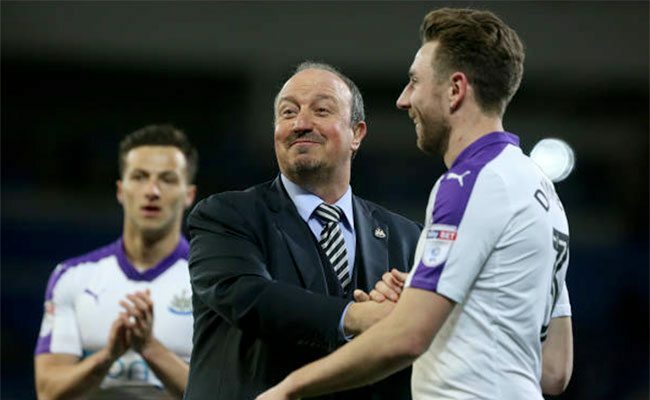 So far Rafa has been fighting against relegation and trying to get us promoted and those two goals required a particular sort of mentality which meant we had to get points, not plaudits. I am hoping that as we establish ourselves back in the PL he may relax and we might go looking for wins rather than preventing defeats and that might be more fun. A mark out of 10? Somewhere between Fat Sam’s ‘0’ and Keegan’s ’10’. About a 9. I have complete trust in him that he knows what to do and I feel my team is safe in his hands. I will try to keep my moaning about gung-ho football to a minimum, I’ll try and let it go. We won’t get a better manager than him and it couldn’t have come at a more critical time. In Ashley We Trust? No. In Charnley We Trust? No. In Rafa We Trust may be a cliché but it does sum up my relationship with him. In Rafa We Become Deliriously Excited? No. That’s why he is a ‘9’. If no signings (other than Atsu) where would this current squad/team finish in the Premier League? Somewhere in the bottom 6 depending on injuries, suspensions, luck and referees. If those sorts of things went for us, 15th, if they didn’t, bottom 3. Most PL teams have got average players in their teams. I don’t think Paul Dummett is any better or worse than Danny Simpson or Phil Bardsley at Stoke and they do ok. You just don’t want too many of those players in your team. I think we would have too many of those players if we didn’t buy anyone and where we finished would be down to a margin of a few points which are decided by things out of our control, deflections, incorrect red cards etc. If we signed no one, we’d be relying on fortune. With level of signings you anticipate, how high do you think Newcastle can aim next season? NUFC can aim for 8th. I’m not saying we will finish 8th, but we can. We are not going into the unknown here. There is absolutely no reason to fear the likes of Southampton and West Ham. They might finish above us next season, but at least if we make them earn it then I’ll be happy. I’m not expecting us to win the league but I’m not expecting us to be in any danger of relegation either. If 10 was Mike Ashley totally changing his outlook on running Newcastle and 0 not at all, how far do you think he has moved (if at all) in the 15 months Rafa Benitez has been at St James Park? I’ve never liked anyone who ran NUFC, I’m a football fan and I don’t like sensible decisions taken out of needs for the business rather than the team. However, for all I didn’t like McKeag onwards, I didn’t give them much of a thought because I think they all had the interests of NUFC at heart. Even when Shepherd and Hall got stung by the fake sheik I didn’t really mind, they were just a couple of big-mouth chancers who got caught with their pants down but they still wanted the team to do well. Ashley is different. Everything he does, he does to make his wallet fatter with no other concerns. I don’t think he has changed his outlook at all. I think he still only owns NUFC because it makes him money in some way: tax breaks, free advertising, whatever it is, I’m not a businessman. I am a football fan though and I know that anything good that happens while he is in charge will happen in spite of him not because of him. So I’ll give him a big, fat nothing. Which is what he has given us, hapless chancer that he is. Would you have preferred Sunderland in Premier League or Championship next season? I don’t care to be honest, whatever will be will be. They were obviously going down this season though, it was only the points that they won off us that kept them up the last few years. When they celebrated our relegation, they were nailing their coffin shut in footballing terms. They can stay there or come out into the light, either way I will be taking no interest unless we end up playing against them in the cups. Then they exist for 90 minutes. 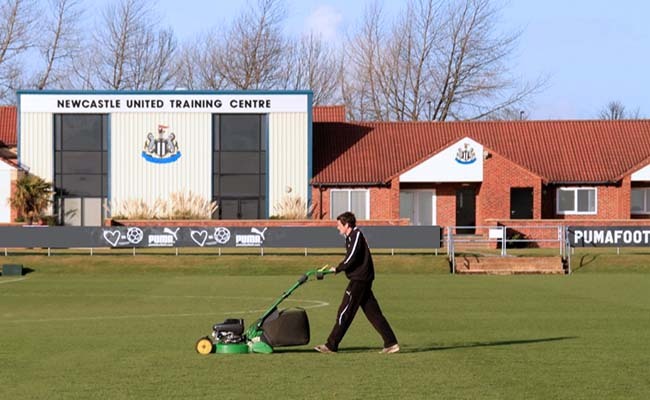 Mike Ashley promised a state of the art training complex some years ago, which was said to be crucial for Newcastle to compete in the future, yet not even a start on it yet. How important is it that this happens? The best managers all seem to think that the players need to be coached in the best facilities to get the best out of them so I suppose it must be true and therefore it is very important. It’s not true in my job, some of the best work I have done has been in crappy surroundings or rubbish conditions. Sometimes that sort of thing makes you give care a bit more, inspires you and your colleagues to do better. Still, if the likes of Rafa think that treating our bling-loving, egotistical celebrities like prima donna millionaires rather than working people, then who am I to argue. Build a palace for them if it will make them try harder and play better next season. When announcing the club accounts in 2016, Newcastle United stated that Sports Direct were going to start and pay a market rate for all of SD’s free advertising. The 2017 accounts indicated that this hadn’t happened. Would it be a major step forward in Mike Ashley’s relationship with the club if this happened? No. See my previous Mike Ashley answer. The bloke is a first class get and it won’t help his relationship with me. I am much more interested in the football though and that is my first priority. Not who plays, who manages or who owns the club, just seeing 90 minutes of fully committed skilful football played by two teams trying to win a game. If I saw that most weeks I wouldn’t be bothered by issues like free advertising. Because of Ashley’s greed and my love of a good moan, NUFC has become a battle-ground between him and me rather than an afternoon of slightly drunk sporting enjoyment. The only ‘step forward’ for me was getting Benitez to stay. I trust him to do a honourable job and it seems so do most other fans. Rafa is keeping me off Ashley’s back. Personally speaking, Ashley can keep his free advertising as long as he keeps Rafa in charge of the football.